Defying Coup Regime, Zelaya Attempts Return to Honduras | Democracy Now! professor of Latin American history at NYU and author of Empire’s Workshop: Latin America, the United States, and the Rise of the New Imperialism. JUAN GONZALEZ: Ousted Honduran president Manuel Zelaya has arrived at a Nicaraguan town just south of the border from Honduras as he plans a second attempt to return home. Zelaya has been in exile for the past four weeks, after he was forcibly flown out of the country in a military coup d’état. He first attempted to return on June 5th, but his plane was prevented from landing when the Honduran military blocked the runway. The coup regime has threatened to arrest Zelaya if he sets foot in Honduras. Zelaya has urged soldiers to ignore orders and says he will try to enter the country as early as Saturday. Before setting out from the Nicaraguan capital of Managua, Zelaya told reporters he was traveling unarmed and accompanied by his family. PRESIDENT MANUEL ZELAYA: [translated] I have asked that my wife and children accompany me, and I have made the military responsible for any damage. I am going unarmed, peacefully, so that Honduras may return to peace and tranquility. JUAN GONZALEZ: Zelaya is also accompanied by Venezuelan Foreign Minister Nicolas Maduro. The coup government has imposed a curfew in areas along the border with Nicaragua in a bid to keep Zelaya’s supporters away. AMY GOODMAN: Zelaya’s attempt to return comes as mediation talks in Costa Rica broke down earlier this week. Costa Rican president, Nobel Peace Prize winner Oscar Arias, produced a detailed plan to facilitate Zelaya’s return, but it was rejected by the coup regime. We go now to Tegucigalpa, Honduras, to speak with Greg Grandin, professor of Latin American history at New York University and author of Empire’s Workshop: Latin America, the United States, and the Rise of the New Imperialism. He arrived in Tegucigalpa earlier this week and joins us on the phone from there. Greg Grandin, what’s happening on the ground right now, as President Zelaya is about to attempt to return to his country? GREG GRANDIN: Well, it’s the second — the beginning of a second — it’s early in the morning. It’s 6:00 in the morning, and it’s a two-hour difference. It’s the second day of a two-day strike, in which organized labor unions have shut down many state institutions. In Tegucigalpa, there were a number of roaming protests, including the shutting down, for most of the day, the main road between Tegucigalpa and San Pedro Sula, which is the main economic hub, San Pedro Sula. On the news, there were reports of deadly major disturbances in San Pedro Sula. And Zelaya’s sympathizers are apparently mobilizing, moving towards the border in buses and in private cars, but the military has set up a roadblock. And as you mentioned in your lede, there’s a 6:00 p.m. curfew and basically a state of siege on the southern borders, and the Honduran military is mobilized, as an attempt to — it’s unclear at what point he’s going to try to enter, if he does try to enter today — that’s the plan — from Nicaragua. There’s some doubt and a lot of rumors swirling around. JUAN GONZALEZ: And, Greg Grandin, what’s the human rights situation at this time among the ordinary Hondurans? There have been some reports of extrajudicial killings. Could you talk about that? GREG GRANDIN: Yes. Yesterday there was a press conference of an international observation mission made up of fifteen groups, international, mostly from Latin America and Europe, from Denmark and — from Denmark and France and other European countries. And they put out a quite damning report, a preliminary report. The final one is due in a few weeks. But they were in the country for a bit of time, and they traveled outside of Tegucigalpa, where foreign reporters often don’t get to, in some of the most vulnerable and isolated areas. They ruled that there is grave and systemic political persecution going on in the country. They’ve documented seven political assassinations, at least two disappearances. And I spoke to one of the members of the commission. She said if they had had more time, they certainly would have — the numbers would be higher. They received reports of more, but they couldn’t verify. At least one body was turned up in an area that served as a clandestine cemetery for death squad operations in the 1980s. Over a thousand people have been detained under the curfew. There’s also reports of widespread political intimidation, workers in San Pedro Sula being forced to attend pro-government rallies under threat of being fired, death threats against alternative media. You know, in Honduras, most of the media is corporate-controlled, the television and major newspapers. But in the countryside and provincial cities, they tend to these local radio stations that have a little bit more liberty, and many of those have been targeted and occupied. Radio Progreso in the city of Progreso, for example, is run by a Jesuit priest, and that was — that came under severe pressure, but I think it’s been reopened. JUAN GONZALEZ: You reported about the reappearance of one of the infamous death squad leaders of the old Battalion 3-16 from the period of the Central American wars. Could you talk about that? GREG GRANDIN: Yeah. I mean, this is the thing. The coup government is going to great lengths to present an international face as being democratic and modern and open and constitutional, but, you know, in Honduras you get a very different sense of the constituency of the coup. And there’s definitely been a reappearance of a certain kind of anti-communist, Cold War, national security type. And one of the most infamous is Fernando Joya, Billy Joya, who was, I believe, a lieutenant captain or a lieutenant in Battalion 3-16, one of the most infamous death squads that operated in Honduras in the 1980s. He was in exile for quite a while in the 1990s on charges that he had kidnapped and tortured a number of students, as well as been involved in other disappearances and other crimes against humanity. He returned to Honduras at some point before the coup as a security adviser for one of the major corporate telecommunications and media operations here. And after the coup, he came out more and more in public. He has given interviews. And he was just named special adviser to the Micheletti — the Roberto Micheletti government, for security. In one of these pro-government marches, he’s appeared walking side by side with Micheletti. And for Hondurans who have a memory of the Dirty War of the 1980s, he, in particular, is a particularly potent symbol of just how retrograde and reactionary the coup is. AMY GOODMAN: In fact, Professor Grandin, wasn’t Joya, Billy Joya, jailed for about a year after he returned to Honduras? GREG GRANDIN: I don’t — he might have been. I don’t have that information. I know he was in exile in Spain, and there was attempts to extradite him. And then, all of a sudden, the people that I spoke to, they were surprised that all of a sudden he was back in public life and enjoying quite a — quite a reputation. He’s often on the news here, local news, as an international analyst. 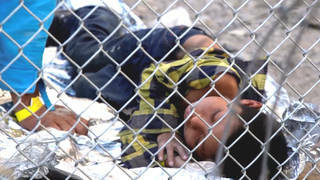 AMY GOODMAN: Talk about what’s happening now on the border. What do you expect we’re going to see with President Zelaya attempting to return? What’s happening? GREG GRANDIN: Well, as you mentioned, Zelaya set out from Managua yesterday over land in a jeep. He has repeatedly — he’s given a number of interviews. He said he was going to make his way to the border and spend last night in a border town in Nicaragua, and he was going to attempt to enter Honduras with his family. I know there has been efforts of his supporters — and again, many of them come from the countryside. Oftentimes we only get the image here from Tegucigalpa, San Pedro Sula, but much of Zelaya’s base of support came from the countryside. He comes from a ranching family, and many of his reforms actually benefited the rural areas. And many of his supporters have been mobilizing and moving toward the countryside. But there’s reports that the military is not letting them — stopping them at about ten kilometers to the border. It seems like there’s only two alternatives that could happen if he does cross the border: he’ll either be arrested, or he will — or soldiers will accept him as the legitimate president, which, frankly, seems a bit doubtful. The head of the military, Romero Vasquez, who staged the coup, effectively issued what one could read as a not-too-subtle death threat against him yesterday. They said — he claimed that Zelaya may be killed by his own supporters, as an attempt to establish him as a martyr, which I think many here would read as a not-too-subtle threat of assassination on the part of the armed forces of Honduras. JUAN GONZALEZ: And, Greg, the collapse of the talks that Costa Rican President Oscar Arias was trying to — was mediating, any sense — did Arias make any statements after that about the cause of the collapse? GREG GRANDIN: Well, I’m not sure how it’s being reported in the United States, but here it’s fairly — in Latin America, not so much in Honduras, not the Honduran media, but it’s fairly clear that the cause of the collapse was the absolute intransigence of the coup government, Roberto Micheletti. Zelaya immediately accepted all of Arias’s seven points, even though, in many ways, people saw them as a major concession that established a legitimacy of the coup government. Many people were urging Zelaya not to accept any conditions whatsoever. Zelaya accepted them. They were conditions where that he would preside over a reconciliation government; that they would move up elections; that there would be an amnesty, a general amnesty, for all involved for a certain period of time. And Zelaya immediately accepted them. And this was understood to be basically the proposal advanced by the United States through the offices of Oscar Arias. And Micheletti rejected them out of hand. I mean, the coup government’s really in between a rock and a hard place. Even if they were to get major concessions and that would establish their legitimacy, just the fact of having Zelaya return, under any conditions, I think would embolden social movements in this country to a degree that would really challenge oligarchic rule, no matter what the concessions are on paper. So they’ve rejected the return of Zelaya under any conditions, except imprisonment. And I think they — they seem to be under intense pressure by Washington to accept Arias’s proposals, but so far they’re holding out. Now, what’s going on is, it seems like Latin America, particularly South America — Brazil, Chile, in particular — are stepping in and taking a more active role in negotiations. There was a sense that South America ceded this crisis to Washington. You know, if you remember last year, there were two major crises in Latin America — South America that they solved on their own: Colombia’s attack on Ecuador and the attempt to destabilize the Bolivian government. Both of those crises were solved by South American diplomacy. And there was a sense that South America was ceding this crisis to Washington. And obviously, Washington has failed and has been unable to solve it. And now, I think, maybe, hopefully, what we’re going to see is a renewed engagement by Brazil, by Venezuela, by Chile, in an attempt to bring this crisis to a resolution. AMY GOODMAN: Alejandro Diaz, the chief inspector of Honduran police, said, “Me detain him? Ha, ha, ha” — the guy on the border — “What you saying?” So it looks like it’s not clear what would happen on the border. But in terms of the US role right now, because you’re saying the US has pretty well sanctioned what’s happened in Costa Rica, $180 million continuing aid to Honduras, and the man you talked about leading the coup, Vasquez, trained at the Army School of the Americas at Fort Benning. GREG GRANDIN: Yeah. I mean, there certainly are a number of things the United States could do to step up pressure on Honduras, the cutting off the rest of the aid. It could easily freeze the bank accounts and revoke the visas of the coup plotters, something that would have no impact on the poor people of Honduras, as many critics of too much of sanctions claim cutting off trade and aid would do. There are a number of things that the United States could do. But, obviously, the State Department is holding — is trying to hold those cards. Hillary Clinton has a close association with a number of people who are actually lobbying on behalf of the coup government. Lanny Davis, ex-adviser, former adviser of Hillary Clinton, has been contracted by business associates and business — the business community in Honduras to basically lobby on their behalf to get Washington to recognize the government. So I think there’s some — just as there’s divisions here in Honduras, I think there’s divisions in the US on how to respond to this. And obviously, Obama, in many ways, is distracted by other issues and has let the State Department deal with this, take the point on this, and it hasn’t worked out so far. JUAN GONZALEZ: And finally, Greg, he is coming over from Nicaragua, supposedly, into Honduras. Any indication of whether the Nicaraguan government is either massing troops at the border, or, somewhere or other, might end up getting involved in this? GREG GRANDIN: The massing troops — I think that, certainly, the Honduran government is raising — the more it becomes under — the more it comes under siege, the more divisions start to appear within the coup coalition. I think that they’re deflecting and looking for scapegoats. They claim — focusing more and more attention on Venezuela. The obsession with Chavez in this country in the corporate media is quite amazing. And certainly, they want to paint themselves as nationalists, as resisting foreign intervention, and that foreign intervention coming from Nicaragua and Venezuela and Bolivia. I don’t think that — Nicaragua is obviously supporting Zelaya. There’s reports that Eden Pastora is actually traveling with Zelaya. But I wouldn’t say that they’re massing troops. I think they’re probably going to — they’re probably providing with a security detail, but I don’t think there’s any belligerence on the side of Nicaragua. On the other hand, Honduras — Honduran government has been rounding up Nicaraguan migrants, you know, people who just work in the market, aren’t political at all, and detaining them indefinitely. That’s another one of the violations that was documented by the international observation mission. AMY GOODMAN: Well, Greg Grandin, we want to thank you very much for being with us, professor of Latin American history at New York University, author of Empire’s Workshop. Also, his latest book is called Fordlandia. He is speaking to us from Tegucigalpa, the capital of Honduras. We will continue to follow the developments in this coup and the attempted return of President Zelaya.